I was spending a rainy weekend at home but with plenty of paperwork and computer work to do. So, a rainy, working weekend at home. No lazing around watching movies and cooking a Sunday roast with all the fixings, sadly enough. So I took a stroll through my fridge and pantry and was thinking along the lines of a rice and beans dish with some extra veggies thrown in. But looking through my Pinterest feed gave me a better idea. 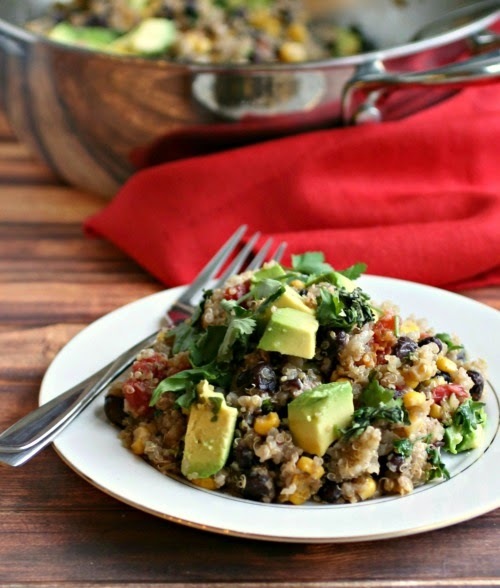 A quinoa dish, instead of rice, with those same southwestern flavors. Healthier and much more filling which, considering I didn't have any meat to go with it, seemed a better choice. 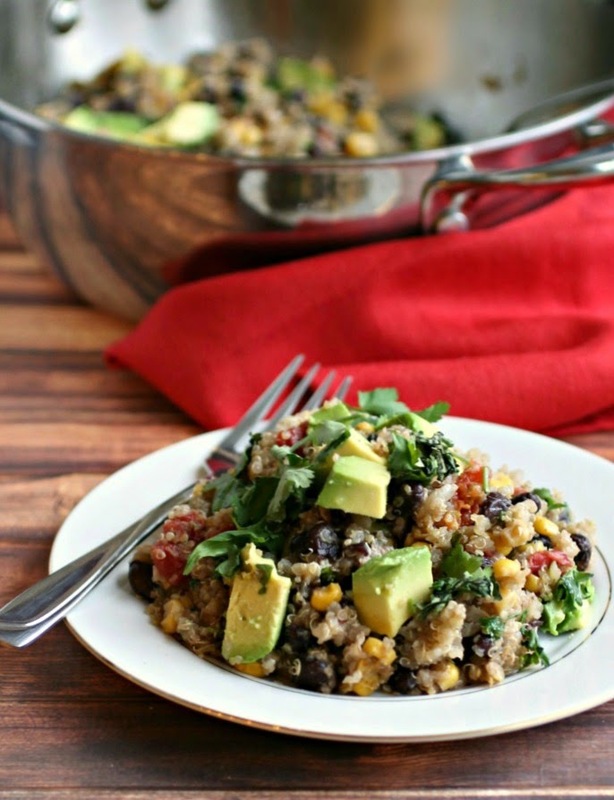 What's great about this meal is that it comes together in one pot and amazingly fast. But, of course, the best part is the flavor. The combination of beans, corn and tomatoes is a classic because it's so good and the cream avocado and cool sprinkling of lemon juice really elevates it. I went back for seconds. Speaking of the pot, though, this recipe was perfect for my new OXO beauty. Last week I made my Creamy Chicken Casserole in the oven with it and now it cooked perfectly on the stove top. I love new kitchen toys! And I love winning new recipes. This one is going into the 'make again very soon' pile. Enjoy! Add the olive oil and diced onions to a large pan and saute on medium heat for a few minutes until translucent. Stir in the tomatoes and cook for an additional couple of minutes. Add the garlic and continue cooking for one more minute. 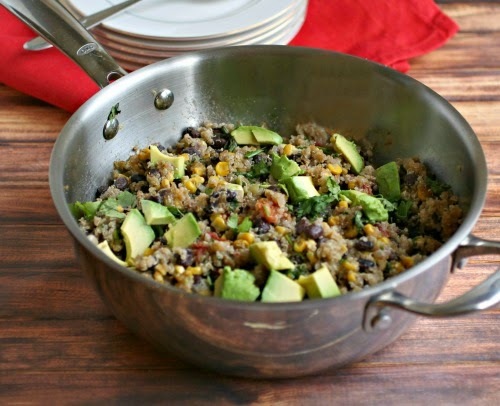 Stir in the quinoa, black beans and corn. Add the stock and season with the cumin, salt and pepper. Bring to a boil, cover, reduce the heat to low and simmer for 25 minutes. Stir in the cilantro and lemon juice. 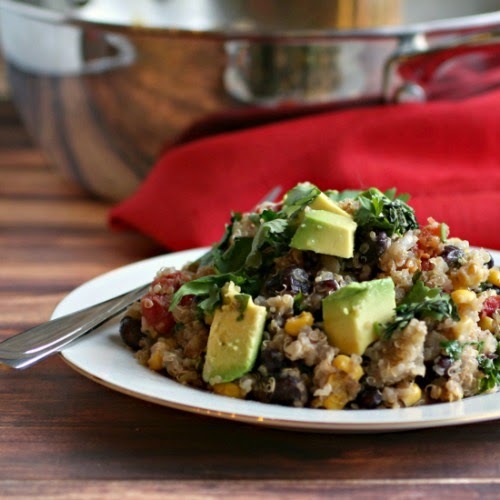 Serve with the diced avocado.